Among the revelations: Lockheed Martin gets a bigger share of each American tax dollar than the National Institutes of Health. 1. Thanks to the Trump tax deal, taxes are way down for corporations and billionaires. In 2017, individuals and corporations were still paying taxes under the old system. The Trump tax plan that Congress passed in December 2017 hadn’t yet taken effect. In 2018, the rules have changed. The new tax plan favors billionaires and corporations, while leaving poor and middle income Americans essentially where they are. 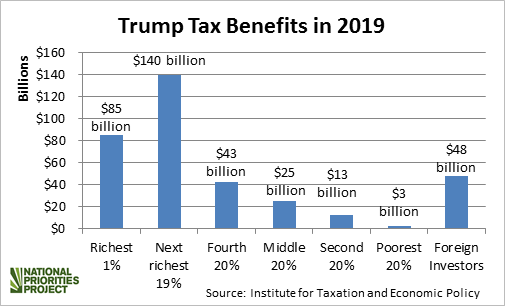 The richest one percent of Americans will receive a total of $85 billion in tax cuts in 2019, while the poorest twenty percent — one in five Americans — will receive tax cuts totaling just $3 billion. Foreign investors will benefit more from the tax cuts ($48 billion) than the bottom sixty percent (or 3 in 5) American earners ($41 billion, combined). Meanwhile, corporations are mostly not passing their tax savings along to workers. Fewer than 3 percent of workers are getting a one-time bonus or wage hike tied to corporate tax cuts. 2. Federal taxes end up in your hometown. Without federal resources, our communities would be unrecognizable. In 2015, state and local governments received more than $657 billion in federal funding. About $67 billion of that went directly to city governments. On average, 32 percent of a state’s budget will come from the federal government. Federal taxes go toward health care, schools, roads, veterans’ benefits, and programs to help the poor and needy in every city, town and state. 3. Health care is the biggest item on your tax receipt. Out of every tax dollar you (and your neighbors) pay, 29 cents goes to health care, and 23 cents goes to the military. The health care portion of your tax dollar is split almost equally between Medicare (11.4 cents) and Medicaid (12.9 cents). Together, these programs provide health care for one in three Americans. Medicaid has been shown to be more cost effective than private insurance. The National Institutes of Health, which funds medical research into cancer, the opioid epidemic, Alzheimer’s disease, influenza and more accounts for just 1.1 cents of every tax dollar. 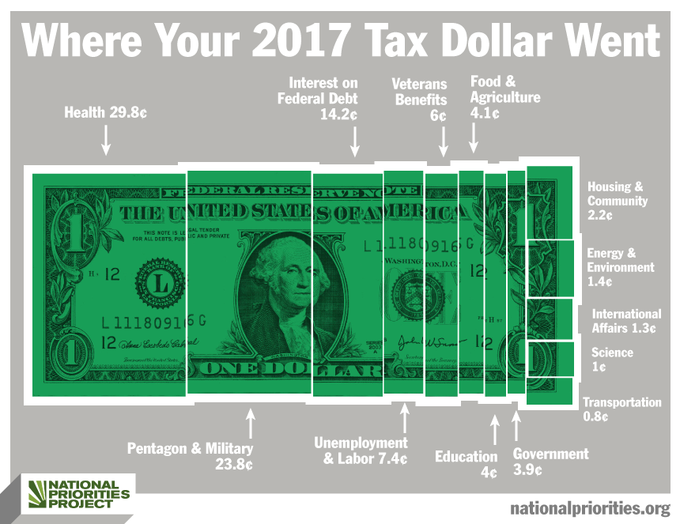 To learn more about where your tax dollar goes — from nuclear weapons to Medicaid to the National Endowment for the Arts — visit our tax receipt. 4. Military contractors take eleven percent. Of every dollar you pay in income taxes, 23 cents goes to the military – but only 5 cents goes to our troops in the form of pay, housing allowances and other benefits. That doesn’t include the 6 cents that supports our veterans by providing health care, income support and job training, among other benefits. Meanwhile, 11 cents goes to military contractors, including 1.7 cents for the Pentagon’s biggest contractor and maker of the F-35 jet fighter, Lockheed Martin. 5. Some profitable corporations pay nothing in taxes. 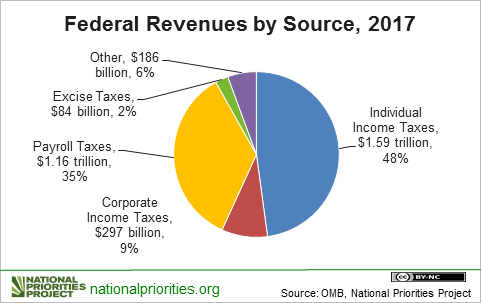 Corporations contribute only about 9 percent of federal revenues – and many profitable corporations use tax loopholes to pay nothing at all. From 2008 to 2015, one hundred Fortune 500 companies managed to pay nothing in federal taxes for at least one year, and sometimes more. Eighteen companies — including General Electric, Priceline.com and PG&E – paid nothing for all eight years despite making a profit every year. The Trump tax law lowered the official corporate tax rate from 35 percent to 21 percent, but as these facts demonstrate, many corporations were already paying less than that. 6. Our tax system can help working families. While many of the biggest tax breaks in our system benefit the 1 percent or corporations, some tax breaks benefit working families. Families and individuals that do paid work can receive the Earned Income Tax Credit. For a family of four with two adults and two children, families earning up to $51,492 can claim the credit in 2018. A family with two children can get a tax break of up to $5,716. In 2015, one in five taxpayers claimed this credit. Other tax credits help working families, too. The Child Tax Credit helped more than one in seven taxpayers in 2015, providing an average tax break of $1,200 to families with children. Our progressive tax code is designed so that the more money you make, the higher percentage you pay in taxes. Ideally, everyone pays what they can afford, and our government has the money it needs to function. Starting in 2018, the highest tax rate for the wealthiest Americans is 37 percent. Only taxpayers with incomes over $500,000 (half a million dollars) pay this rate, and it only applies to their earnings above that amount. But there’s nothing magic about 37 percent. Last year, the top tax rate of 39.6 percent. 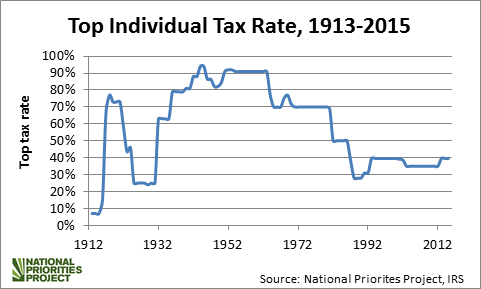 If you go back to just the 1960s, 70s or 80s, the top tax rate was much higher – between 50 and 94 percent. Even a small change in the top tax rate, of a few percent, can make a big difference in how much the federal government brings in – and that revenue can be used for anything from health care, to the military, to reducing the deficit. Originally published by the National Priorities Project.